UV silicone wristband changes color when exposed to UV rays from the sun. Choose debossed, screen printed, debossed with color fill or a combination. The UV bands purpose is to promote awareness of UV protection. The more UV exposure, the weaker the color change effect will become over time. Our testing indicates after 14 hours of direct sunlight the UV agent in the silicone band will lose the intensity of color changing. Average reaction time is 14 hours upon exposure to UV rays. 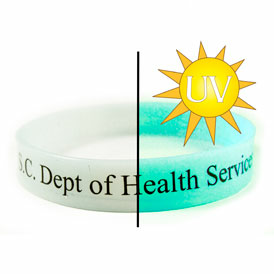 Translucent "frosty white" color wristband changes to one of the following colors when exposed to UV rays, Light blue (most popular) or light pink. SW-0602 Debossed design with color fill. SW-0600 has a debossed design - 3/8" H x 7-1/2" W design area. SW-0601 has a 180 degree, one PMS matched screen printed design - 3/8" H x 2-3/4" W design area. SW-0602 has a debossed design with one PMS matched color fill - 3/8" H x 7-1/2" W design area. For silicone UV color change add $40.00 (G) setup per color change (500 piece minimum per color. For an additional PMS matched screen imprint color please add a $0.10(C) run charge plus an additional set-up charge for each additional color. For a 360 degree screen printed design - 3/8" H x 7-1/2" W design area, please add a $0.10(C) run charge plus a $27.00(G) setup per color. For an additional PMS matched color fill please add a $0.10(C) run charge for each additional color. Youth size: 7-1/8" circumference x 1/2" x 2mm. Requires tracking label and safety testing if intended for 12 year olds and under. Please add 0.04 (A) for tracking label. Call for pricing for safety testing.